Does this work with the FULL video? When downloading the song, don"t forget that the song is the Radio edit of Bad romance. Absolutely perfect. Can almost ace it it"s that accurate. Thank you! Ich habe die fehlende Stelle im Text ergänzt und einige der "~"-Zeichen ersetzt, da sie das Textlesen beim Singen sehr erschwert haben. Die Textdatei passt so wie sie ist perfekt zu meiner .m4a Version aus iTunes. Big problem with the album version. There is no gap at all, I mean gap has to be = 0 and it works quiet fine. As the lyrics are concerned, there is another problem just before "" walk walk fashion baby "" because an entire part "" Rah-rah-ah-ah-ah! 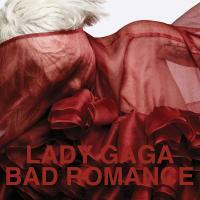 Want your bad romance "" is missing. Anybody know how to add this part without being oblige to re-do everything ??? wo krieg ich das video her? how long should be the mp3??? Bei mir ist der Text eine halbe sek schneller als das Video..
Muss ich den BPM oder den GAP wert ändern? Ich check nicht wie ich des jetzt singen kann ! Wohin soll ich des packen ? Check your error.log in the installation dir. If it says something like mp3-tag missing, you most probably have a wrong mp3-filename. Check in windows if you have disabled extensions for known file types (extensiones para los tipos de archivos conocidos). how i do to get it? Hi Jagafe, try to write in English. como hago para k me salga?? "Rah rah" no problem "oh lala"
excelente tema muchas gracias al creador!!! WHERE (and beyonce/mariah) DESERVES TO BE! Yupi, GaGa on first place!! i have the correct video but cant find suitable mp3 for this txt..
There´s another "Oh, caught in a bad romance" in the beginning and 2 more "walk, walk fashion baby" in the middle of the song. The Video-Version is also slightly faster. I´ve added these parts so the txt should fit to the video now.